Is it just me or is anyone else super thankful that they have air conditioning right about now? I love summer and summer activities, but I don't enjoy humidity or sweating at all! I actually had to give myself a pep talk to go outside to water my plants and shrubs. So instead of playing outside, I've spent the majority of the day inside catching up on blog posts from the last month and a half. I have also started working on a few new items, as well. I went ahead and posted one in my TpT store. 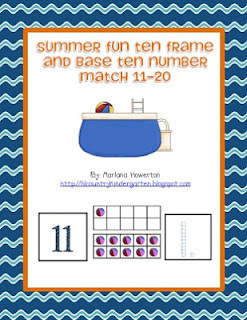 It's another ten frame and base ten number match called Summer Fun! I hope you like it! Just click on the picture below to purchase this activity from my TpT store! Thanks for the freebie. My little kinders always seem to need extra practice with those pesky teen numbers. Enjoy your summer! Thanks. I plan on copying these for my student's summer packets. This will be great summertime review. Thanks, Julie! I hope it helps your kiddos! You're welcome, Michele! I plan on having an amazing summer! I hope you do, too! You're welcome, Jessica! Have a great summer! I'm featuring this post on Bagels and Blogs tomorrow!